If you’re scrambling for some sweet additions to your kids Easter baskets, look no further. I have a meaningful idea you can quickly and easily make that costs zero $. As a bonus, this has no candy either! Now, I love coupons–clipping them, using them, researching them online, and so on. One of my favorite sites that I visit regularly is thefrugalgirls.com. 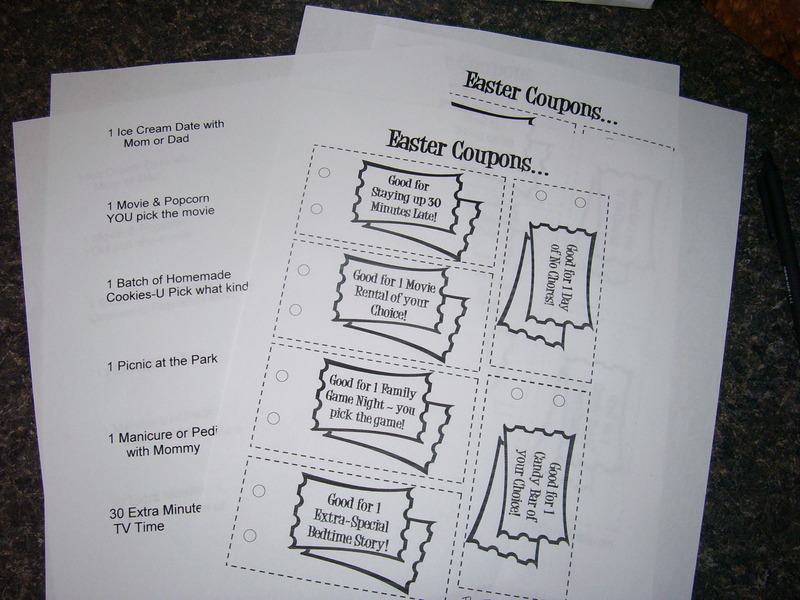 This past week they had printable Easter coupons for kids. What a grand idea! I printed out a few sheets and then came up with some of my own more personalized ones that I typed up and printed out. 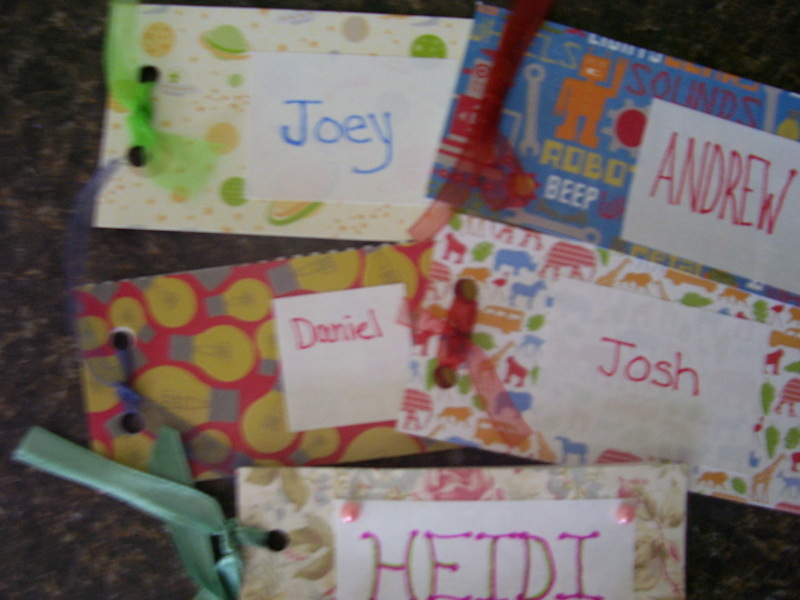 Kids coupons, waiting to be clipped. For some of the ones I made up I even drew a little picture or used a scrapbooking sticker to go along with it. 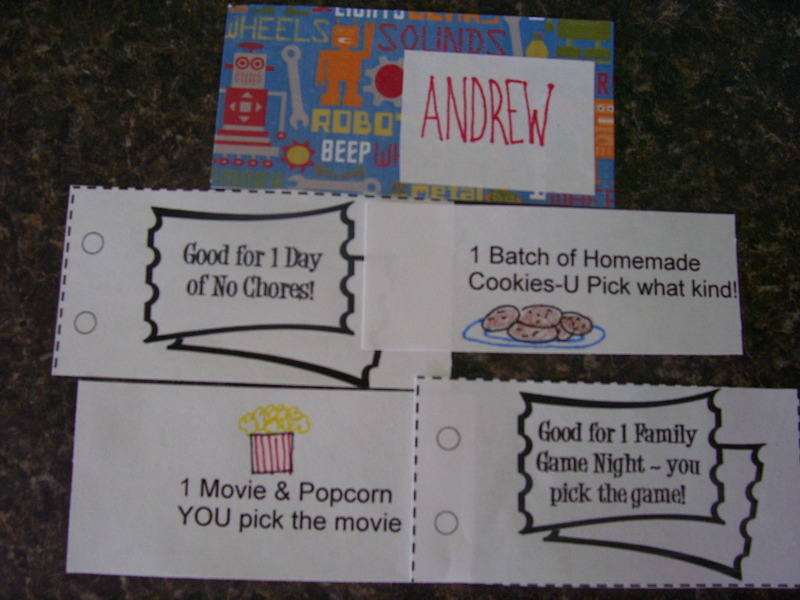 After that, all I did was cut out a rectangle of cardstock slightly larger than the coupons and added each child’s name to the front. I used printed cardstock that suited each of their personalities and punched two holes along the side of each coupon and cardstock cover. Andrew’s book cover and coupons before assembling. To wrap things up, I laced two ribbons through those holes to “bind” their coupon books. Now they’re waiting for the Easter bunny (aka Mom) to put them into their baskets tonight. 5 coupon booklets, each one a bit different.